Navigate to your Team's Home Page and click on the plus sign in the green box which you will find next to the WELCOME banner or first message (or use "Add Bulletin" under "Options". If you also want the message emailed to your team, as well as posted as a News or Bulletin item, then click on the Broadcast message: box before you click on "Submit". Sometimes you need to get time sensitive information to your player's parents and email is too slow. The website has a feature to send Text Messages to cell phones for those parents who turn the feature ON. 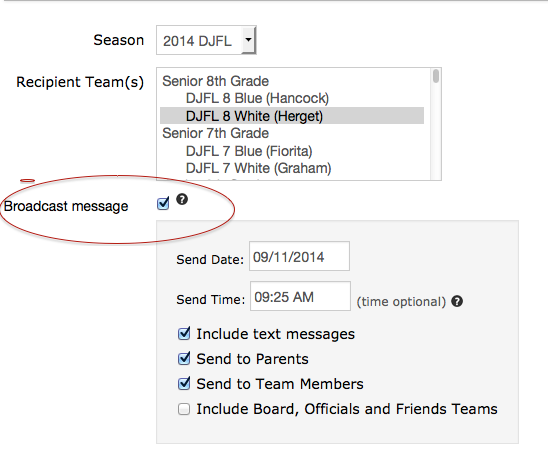 When you create a bulletin message that you are also emailing to the team, simply check off the "Broadcast Message" box at the bottom of the News Bulletin screen along with the email features check box.